SYG Nursery has a huge inventory of landscape and garden supplies including annuals & perennials, trees & shrubs, bulk bark, rock & compost. Many of our bedding plants and veggies starts are grown right here! We carry organic potting soil, fertilizer, compost & amendments. We offer a variety of seed starting products, irrigation supplies, animal repellents & pest control products. We carry statuary, decorative pots & bird baths. 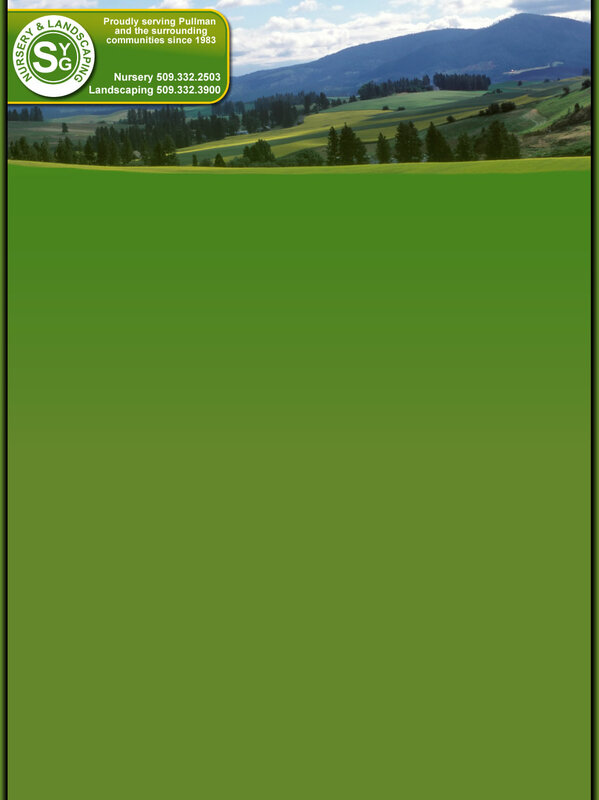 SYG Nursery & Landscaping has been landscaping residential and commercial properties on the Palouse since 1983. We'll get the job done right with our experienced and professional crew. We can design & install a complete landscape or simply beautify that special little corner in your yard. Some of the services we offer include retaining walls, sprinkler systems, ponds & waterfalls. We do hydroseeding, grading, sod, planting & raised beds. We install patios & pavers, also bark & rock. Call us today to schedule a free estimate.